Date: 23 May 2018: By Al-Haq Human Rights Organization: Al-Haq is following with great concern the case of Samah Ibrahim Muhammad Abu Ghayyad, arrested by the internal security apparatus in the Gaza Strip on 9 May 2018, and who has been detained since. Al-Haq calls on the authorities in the Gaza Strip to comply with the applicable constitutional and legal safe guards, and to respect and fulfil Samah Abu Ghayyad’s fundamental rights as enshrined in international human rights treaties to which the State of Palestine has acceded and which are applicable to the Occupied Palestinian Territory (OPT), including the occupied Gaza Strip, regardless of the grounds and reasons for her detention. 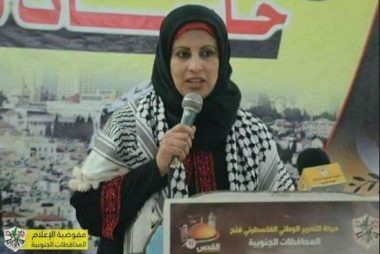 According to information available to Al-Haq, Samah has been detained since 9 May 2018, when officers from the internal security apparatus asked her husband to accompany them to her workplace, from where they proceeded to arrest Samah, confiscate her cell phone and computer, without providing any warrant for her arrest or informing her of the charges against her. Samah, a mother of six whose youngest child Watan is one year old, is the administrative director of the Women’s Programme Center in Nusseirat refugee camp in Gaza’s Central Governorate, which is overseen by the United Nations Relief and Works Agency for Palestine Refugees in the Near East (UNRWA). As stated by her husband in an affidavit given to Al-Haq, Samah is a community activist and Fatah leader in Gaza’s Central Governorate. Following her arrest, Samah was transferred to the internal security apparatus in Deir Al-Balah, where she was subjected to interrogation. She was then transferred to the headquarters of the internal security apparatus in the Ansar area of Gaza City. According to Al-Haq’s field documentation, Samah has not been allowed to meet with her lawyer throughout the period of her detention, despite repeated requests in this regard, the most recent of which was on 20 May 2018, which received no response. For the past fifteen days, Samah’s family, including her husband and children, have not been allowed to visit her. Al-Haq’s follow up into the circumstances of Samah’s arrest by the internal security apparatus in the Gaza Strip raises concerns that she may be subjected to torture or other ill-treatment, notably as her arrest and detention were carried out in the absence of constitutional and legal safeguards applicable to her, as enshrined in the Palestinian Basic Law and the International Covenant on Civil and Political Rights (ICCPR), to which the State of Palestine has acceded, and considering Samah remains under arrest at the order of the military prosecution. Al-Haq stresses that the arrest of Samah Abu Ghayyad and her detention by the military courts, based on Military Justice Law No. 4 of 2008, which was adopted by the Palestinian Legislative Council’s Parliamentary Change and Reform Bloc in the Gaza Strip and is not applicable to the West Bank, and based on the Palestine Liberation Organization’s Revolutionary (Military) Penal Procedure Law of 1979, violates her civil and constitutional rights and international human rights treaties and standards, which must be guaranteed in the pre-trial stage. Al-Haq affirms that the detention of Samah Abu Ghayyad amounts to an arbitrary detention, regardless of the reasons for her detention, as it violates Articles 11 and 30 of the Palestinian Basic Law on guarantees of arrest and detention and the right to be brought before a civil judge. Samah’s arbitrary detention further amounts to a constitutional crime under the Basic Law and the Penal Code applicable in the Gaza Strip. Al-Haq calls on the authorities in the Gaza Strip to release Samah Abu Ghayyad, who continues to be arbitrarily detained by the internal security apparatus in the Ansar area of Gaza City since 9 May 2018, to hold perpetrators accountable for violating rights guaranteed to her under the Basic Law, the Penal Code, and international human rights treaties, and to fulfil her right to an effective remedy. Al-Haq calls on the authorities in the Gaza Strip to immediately and completely stop bringing civilians before military courts, to respect the rule of law, the Basic Law, and relevant international human rights treaties and standards, which affirm the right of every citizen to recourse before a civil judge and require the jurisdiction of military courts to be limited to military affairs.